Each card contains my own original artworks & lunar photography, and are paired with a powerful & loving mantra, inspirational quote, angel or guide. Use Palo Santo- a beautiful, yellow wood that raises energies to their highest, most pure state, which is filled with universal love. Palo Santo means “Holy Wood”, and makes a great energy cleanser and positivity amplifier for your Cosmic Card reading. There’s also loads of rad gear and artworks available for purchase! We’ve hit the super-celestial jackpot for this month, folks! The month of August has been an honorable host to a multitude of celestial events, giving us the Perseid Meteor shower- a wondrous display visible Worldwide. But this August 2017 is delivering some serious performances- here’s a quick breakdown of these heavenly events to mark down on your earthly calendars. Last night, some lucky viewers were able to watch as the moon skirted through the northern part of Earth’s dark outer shadow, producing a partial lunar eclipse. The entire event took about two hours to unfold, starting at 15:50 UT and lasting til 20:51 UT. About a quarter of the lunar disk appeared to darken at the deepest part of the eclipse, which happened at 18:20 UT. This partial lunar eclipse was really a temptress- with only a taste of the penumbra shading bringing the moon into more of a fuzzy shadow, visible with the naked eye. While most of Europe and Africa got to see part of the show after sunset, as the moon rises in the east, the best places to observe will be across India and western China, where the eclipse peaks during the late overnight hours. Eastern Asia, Indonesia, Australia, and New Zealand will witness the eclipse in the early morning hours of August 8. Visible Worldwide, the 2017 Perseid Meteor shower can be viewed on August 12th & 13th. Under the dark, cool summer nights- one might be able to see 50 or more meteors per hour (depending on light pollution). The Perseid Meteor shower is produced by comet Swift-Tuttle, which was discovered in 1862. As it orbits the Sun, this big “dirty snowball” sheds tiny grains of rock and dust. Over time, the particles spread out along the comet’s orbital path. Earth flies through this path every August, sweeping up some of the dust grains. They plunge into our atmosphere at more than 100,000 miles per hour, vaporizing as the streaks of light known as meteors. The Perseid’s are famous for producing a large number of these bright meteors. The shower runs annually from July 17 to August 24 and it peaks this year on the night of August 12 and the morning of August 13. The thin crescent moon will be no match for the bright Perseids this year so be prepared for a great show. Best viewing will be from a dark location after midnight. Meteors will radiate from the constellation Perseus, but can appear anywhere in the sky. With all the light pollution we are surrounded by in this day and age, it’s a shame that fewer and fewer people have actually been able to see the wonders of a pitch black night-sky. Take this time to witness one of nature’s most remarkable night shows- the Perseid meteor shower! You can visit your local park, or any area that is not tainted by artificial lighting. Grab a pair of binoculars, or just look up into the sky, and enjoy the show! This visualization below (see link) shows these meteoroid streams orbiting the Sun, some stretching to the outer regions of the solar system. Select the meteor shower in the menu to see the corresponding meteoroid stream in space. Their meteoroid orbits are based on those measured by NASA’s CAMS video camera surveillance network, and were calculated by meteor astronomer Peter Jenniskens of the SETI Institute and NASA Ames Research Center. The Sun’s second neighbor- Venus, will be cradled by the waning crescent moon in the pre-dawn skies on August 19th. The Moon and Venus will make a close approach, passing within 2°14′ of each other. The cosy pair will be too widely separated to fit within the field of view of a telescope but will be visible to the naked eye or through a pair of binoculars. Perfect to take a time-lapse shot or simply soak up the view. Now the to the main attraction. 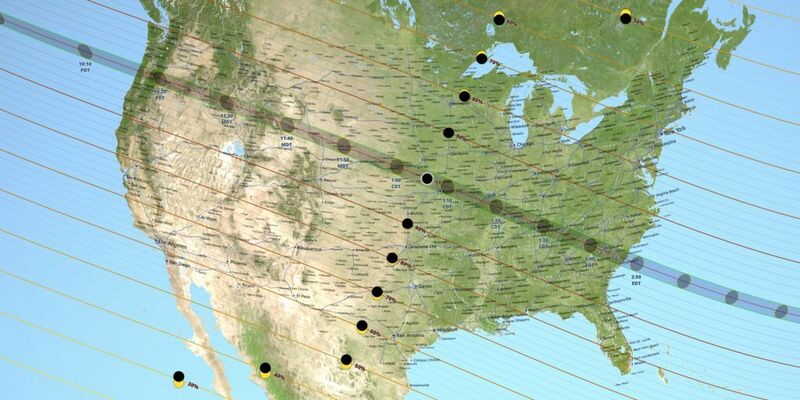 THE most talked about celestial event of the year will finally kiss the horizons of the U.S. from Oregon to South Carolina. Although there will be several eclipses that will pass over the U.S. in the 21 century, it will be the first total solar eclipse visible from the contiguous United States since 1979! For those who are not within the umbra of the eclipse- can enjoy what’s called a partial eclipse. That includes viewers in Canada, Central America, and parts of South America. For many of us, the eclipse will be a once-in-a-lifetime event, and you’ll want to plan ahead. If you’re within the path on eclipse day, you may look directly at the sun (with proper filters), and experience a few breaf minutes of totality- when the moon will cover the sun completely. In those fleeting minutes, you’ll see the dramatic changes going on in the sky and in the landscape all around you (including drops in temperature up to 15 degrees). During the totality on August 21st, you’ll be may able to see 4 planets with the naked eye that near the eclipsed sun! In order of brightness, these planets will be Venus, Jupiter, Mars and Mercury. Don’t forget to make sure you order some eclipse glasses and safe, approved solar filters. These are going fast so be prepared! If you can travel to be in line with the path of totality, it’s defiantly worth the trip! If you can’t make it to any areas of totality, NASA will be hosting an “Eclipse Megacast” on August 21st for about four hours. The show will broadcast on NASA TV, the agency’s own channel, as well as Ustream and YouTube; it will likely be picked up by other TV stations, as well. And expect NASA to have some incredible views of this event: the agency is going to observe the eclipse with numerous satellites. See the National Geographics map of the eclipse path to find out how much of the sun will be covered where you live. And be sure to check out their guide to the total solar eclipse of 2017! 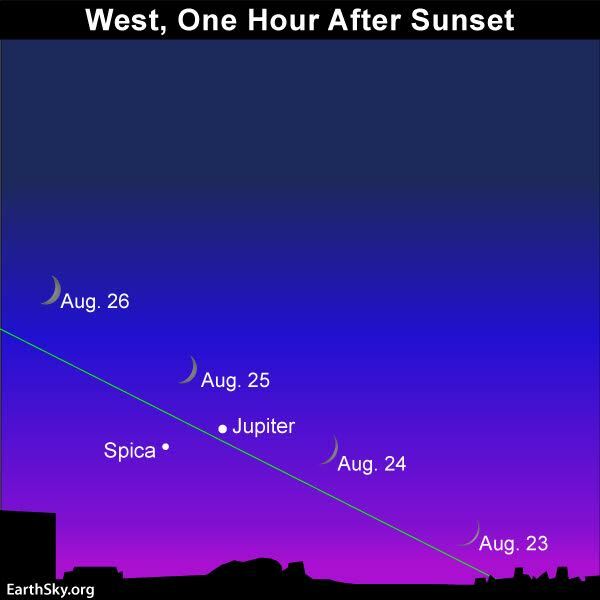 On this day, glance toward the southwest soon after local sunset to check out the impressive crescent moon pairing up with Jupiter. The eye-catching conjunction should make for an amazing photo opportunity. Look closely, perhaps with binoculars, and a third celestial object, the blue star Spica, will appear just below the cosmic pair. 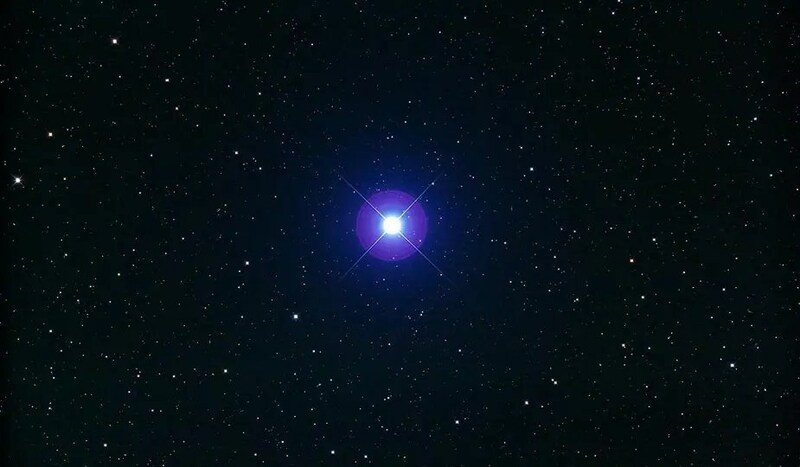 Fixed star Spica, Alpha Virginis, is a blue giant star in the ear of wheat of the Maiden, Virgo constellation. Ending the month with a bang, the moon will position itself alongside Saturn in the evening southern sky. Keep an eye out for the two after sunset. As Saturn is spinning more than 869 million miles away, NASA’s Cassini spacecraft will be getting ready to take its death dive into the planet’s thick atmosphere after touring the Saturnian system for more than 13 years. It’s Grand Final Orbits began April 22 and ends Sept. 15. 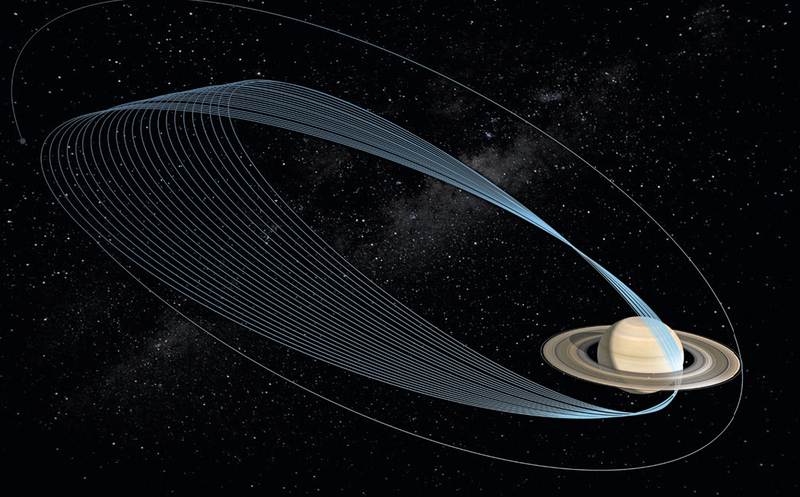 When Cassini is nearest to Saturn during each orbit, the spacecraft’s speed ranges between 75,000 and 78,000 miles per hour (121,000 and 126,000 kilometers per hour), depending on the orbit. For more information about the Cassini-Huygens mission visit https://saturn.jpl.nasa.gov and https://www.nasa.gov/cassini. The Cassini imaging team homepage is at https://ciclops.org. Now THAT’s a grand finale! I want to talk to you about tonight’s Penumbral Eclipse, but first things first. It won’t be as striking as the ones we’ve seen before, nor will the moon become red as when it passes through the Earths “Umbra” during a partial or total lunar eclipse. This penumbral lunar eclipse is really a temptress- with only a taste of the penumbral shading bringing the moon into more of a fuzzy shadow, that will be visible by the naked eye. All my Eastern, North, Central & South America peeps will have a delightful view of this whisper of an Eclipse. If you’re in the North East, you’re in for a treat as you’ll be able to witness the entire eclipse from start to finish. Here are some times below depending on your location. Penumbra last visible? 2:14* 9:14 p.m. 8:14 p.m. 7:14 p.m. 6:14 p.m. Moon leaves penumbra 2:55* 9:55 p.m. 8:55 p.m. 7:55 p.m. 6:55 p.m. So what am I looking for again? During the lunar eclipse on February 10–11, 2017, the Moon skirts just outside Earth’s dark umbra. You can look for deep penumbral shading on the north half of the lunar disk. What really makes this Penumbral Eclipse a beaut is that it falls on Feb.’s “snow moon” with comet 45p coming to join the party! YEY! Comet 45p orbits within Jupiter’s family of comets, which means that gravitation pull from Jupiter effects 45p’s orbit. 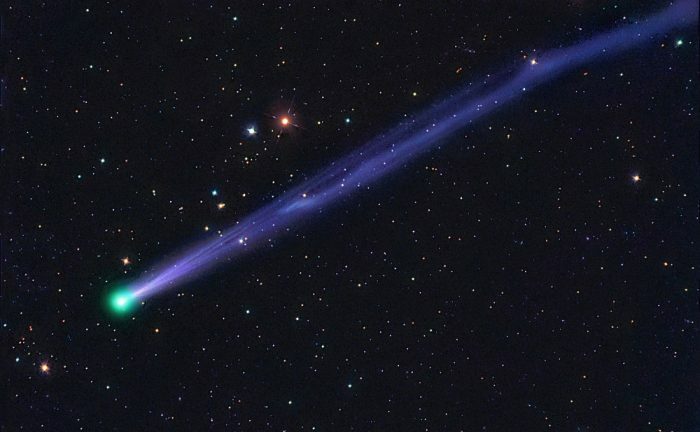 A urethral green glow that trails this comet comes from the diatomic carbon that’s in its nucleus (real nerdy facts). But don’t pop the champagne just for 45p, if you don’t have a pair of binoculars or a telescope and the want to stay up until 3am EST then, unfortunately, you won’t be able to witness this celestial event. Comet 45P won’t come this close to Earth again until 2022. Ok, well maybe pop the champagne anyway!! Can’t see the eclipse? If it’s cloudy at your location, or if the eclipsed Moon isn’t in view, you can watch vicariously via live webcasts provided by the Virtual Telescope Project and by Slooh. Get ready my fellow star gazers! This month, on the night of September 27-28th there will be a total eclipse of the moon- concluding the *Lunar Tetrad (*a series of four lunar eclipses spaced 6 months apart). Representing the fourth and final eclipse of the lunar tetrad- this months Harvest Moon will also be a Blood Moon- making it a Super Harvest Blood Moon. Looking back at how this Tetrad began, the first Blood Moon eclipse happened on the night of April 14-15, 2014. 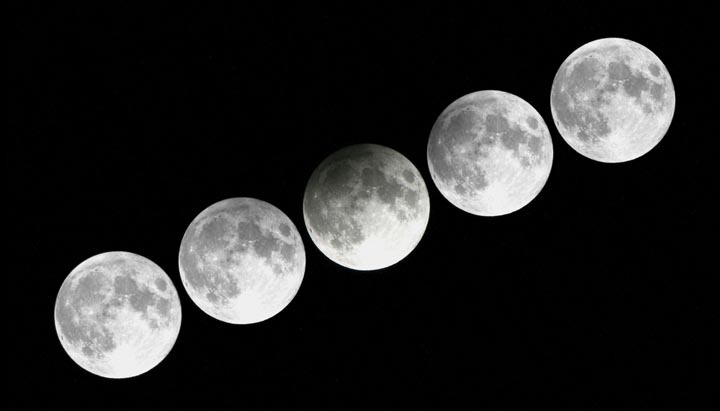 The second one took place on the night of October 7-8, 2014, and the third one (the shortest total lunar eclipse of the 21st century) came to pass on April 4, 2015. The fourth and final total lunar eclipse of this Lunar Tetrad will fall on the night of September 27-28. For my friends across North America- get ready for an awe-inspiring show!